During flood season in June and July, currents can be very fast and powerful in the main part of the river. Click here to view Blackwell Park Operations Ltd’s webpage for additional information. 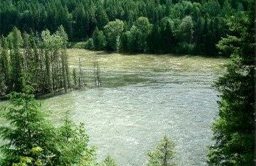 A lovely campground situated at the confluence of the Clearwater and North Thompson Rivers. Popular with travellers on Hwy #5, with young families, or as a base camp for visitors exploring Wells Gray Park and the Clearwater area. At a viewpoint overlooking the meeting of the two rivers, the green of the Clearwater can be easily distinguished from the muddy brown of the North Thompson. Services such as gas, propane and food may be found in Clearwater. Information on Wells Gray and other provincial parks can be found at the Wells Gray Travel Information Centre in Clearwater. Attractions in the area include a miniature railroad, gallery, museum, river rafting, guided horseback riding, rowboat rentals, bike rentals, mini-golf and 18-hole golf, boat tours and hiking. Campground Dates with Full Services and Fees: May 1 – September 30 Off-season: day-use area is open. 5 km south of Clearwater, just off Hwy #5. Cultural Heritage: Traditional use by Shuswap First Nations is indicated by the remnants of kekuli (pit houses) and food cache pits along the riverbanks. Conservation: The park is on the boundary between the drier south and the wet interior. Visitors will find Douglas-fir, lodgepole pine and juniper next to cedar or spruce. Beneath the trees, soopolallie, wild rose, hazelnut, Saskatoon and devil’s club can be found. Wildlife: Squirrels, deer mice and shrews are common with the occasional visits from marten, coyote, deer, moose and black bears. Birds include chickadees, varied thrush, woodpeckers, flickers, swallows and jays. Bald eagles and ospreys can be seen fishing for Dolly Varden, rainbow trout and chinook salmon. For anglers who enjoy river fishing, there are several vantage points easily accessible within the park. Anyone fishing or angling in British Columbia must have an appropriate licence. There are four easy, short trails within the park. and the Terrace Loop 1.3 km 30 minutes. For your own safety and the preservation of the park, obey posted signs and keep to designated trails. Shortcutting trails destroys plant life and soil structure. Excellent adventure playground for small children.